This tooth was very noticeable. 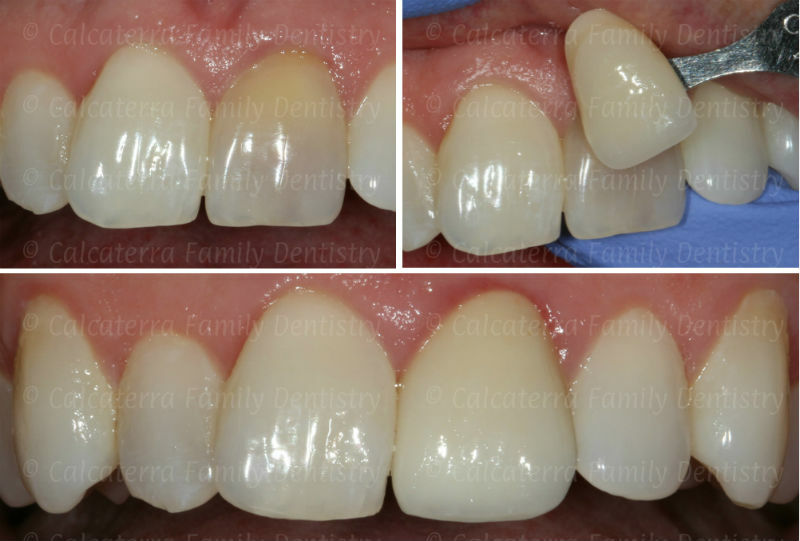 Photo by Dr. Nicholas Calcaterra – dentistry by someone else! 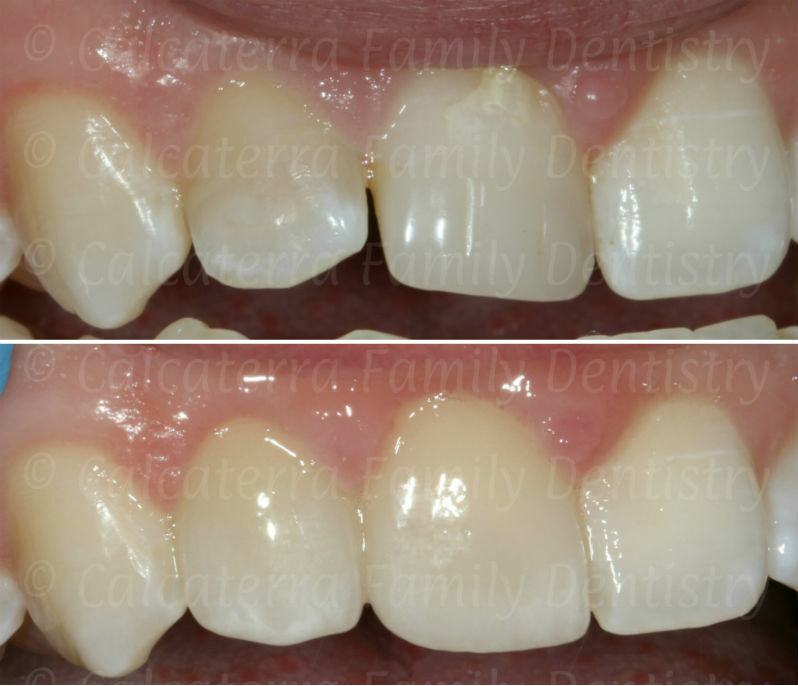 This patient was very uncomfortable with her smile. And she had every right to be uncomfortable (if you want to see how we fixed her smile you can go here). When we analyze the shades of front teeth, we use what is called the 3-D shade guide. The guide is used by cosmetic dentists and has close to 30 shades. Then, when you factor in other variables such as translucency and light reflection, you get close to fifty shades of teeth! So how do we achieve dramatic results? We bent over backwards to match the shade. Without the pre-op photo, you would not be able to tell which teeth have crowns! Photo and dentistry Dr. Nicholas Calcaterra. The above patient lives in Orange and is a student at Amity Regional High School. He suffered trauma to his two front teeth with both requiring root canals. One of his teeth was repaired by another office using bonding. The repair – somewhat sloppy – is very noticeable because the shade and contour do not match. 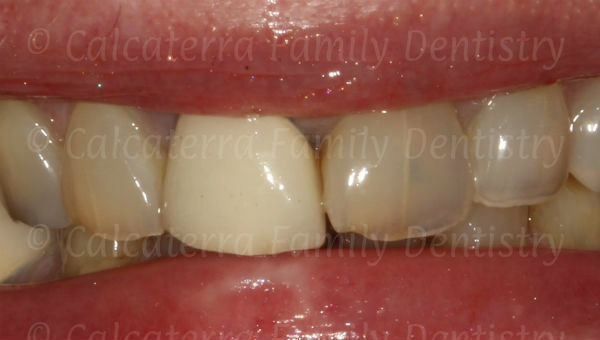 Because of the history of trauma, we did cosmetic all ceramic crowns on both teeth. We worked extremely hard, going through multiple steps (as outlined below), and were able to achieve a remarkable success. We believe the photos speak for themselves. Many of you are probably asking – how do you achieve this? He began with a very dark crown due to trauma, as seen in the upper left. In the upper right, we hold one of many different shade tabs as part of our analysis. Note that he did NOT want the “tilt” or “midline slant” corrected – only the shade – because he felt that was his signature look! Dentistry and photos Dr. Nicholas Calcaterra. We analyze your smile and the teeth/tooth bothering you. We first understand what your concerns are. We then recommend the most appropriate solution. Based on your specific needs, we then select one of many Connecticut based labs that we use. We don’t ship our labwork overseas. We take multiple photos and sometimes have you meet with a lab technician for a custom shade match. We then let you try it in for a test drive – if you don’t like it – we tweak the shade until you are 100% satisfied. Throughout the process, it is a team approach: our team, the lab, and you. If you are unhappy with the shade of your crowns and would like to meet with us, call us at (203) 799 – 2929 or visit this page. We’d love to have you experience fifty shades of teeth. For those of you who have visited our site previously, you undoubtedly know we are one of the only dental offices in Connecticut which offers gluten free dentistry. From fillings to topical fluoride, we have it covered. While we possess a very detailed knowledge of the prevalence of gluten in dental products, we are always looking for additional information to pass to our Celiac or Gluten Intolerance patients. For example, for a patient with celiac disease who has to pre-medicate with antibiotics prior to her dental visits, which antibiotic is gluten free? We’ve seen this scenario more than once! As part of our research, we’ve come across a site dedicated to providing information on gluten free medications. This originated from an article on gluten free drugs in the Huffington Post. Need to premedicate for dental visits? 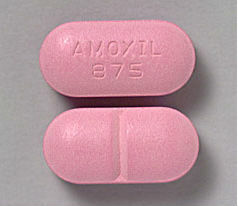 Most formulations of amoxicillin are gluten free. The antibiotic Amoxicillin from some manufacturers have been certified as being gluten free. The antibiotic Zithromax (commonly referred to as Z-Pak) is unlikely to contain gluten but has not been certified as gluten free. The herpes cold sore medication Valacyclovir (marketed under the brand name Valtrex) is gluten free. However, the Valtrex brand name by GlaxoSmithKline is not. The many pain relievers we prescribe after tooth extractions – Motrin, Vicodin, Percocet, and others are all gluten free. The sedative medications Ativan and Halcion (lorazepam and triazolam) that we use for sedation dentistry are gluten free. 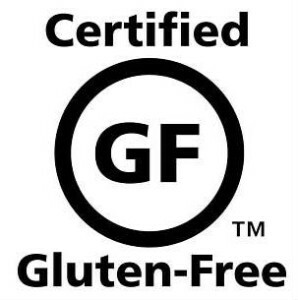 For our large family of patients with either celiac disease or gluten intolerance, if we have to give you a prescription for an oral related condition, we will do everything possible to make sure we prescribe a gluten free medication for you! Legal disclaimer: Please note that the list above is based on our own research and is subject to change. Only the manufacturer can certify for sure if the medication contains gluten or not. When in doubt, contact the manufacturer and/or talk to your Pharmacist.